Homecoming is a tradition at Old Dominion University (ODU) where alumni return to campus and take part in a number of activities to connect with other alumni throughout ODU’s history. The current Homecoming celebration is chiefly organized by the Alumni Association and includes painting paws or crowns on Kaufman Mall, dyeing the water blue in the Monarch Fountain using 1/2 gallon of blue dye, a Homecoming Parade, and an ODU football game. There were plans to create the first Homecoming celebrations in 1937 featuring a formal dance and a football game between the Norfolk Division of William & Mary and the Duke University freshmen team. The football game was cancelled due to heavy rain. 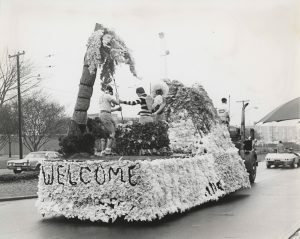 The first complete Homecoming took place the following year with a formal dance and the football team taking on the freshmen team of William & Mary. With the end of football in 1941 and the dawn of World War II, there were no Homecoming celebrations until they were revived again in 1955. That year, the celebrations centered around a formal dance, a men’s basketball game, and the introduction of a Homecoming Queen contest. In order to boost participation and to create a spirit of pride in the students, a bonfire and a “hot dog trot,” or sock hop, were added in 1956. 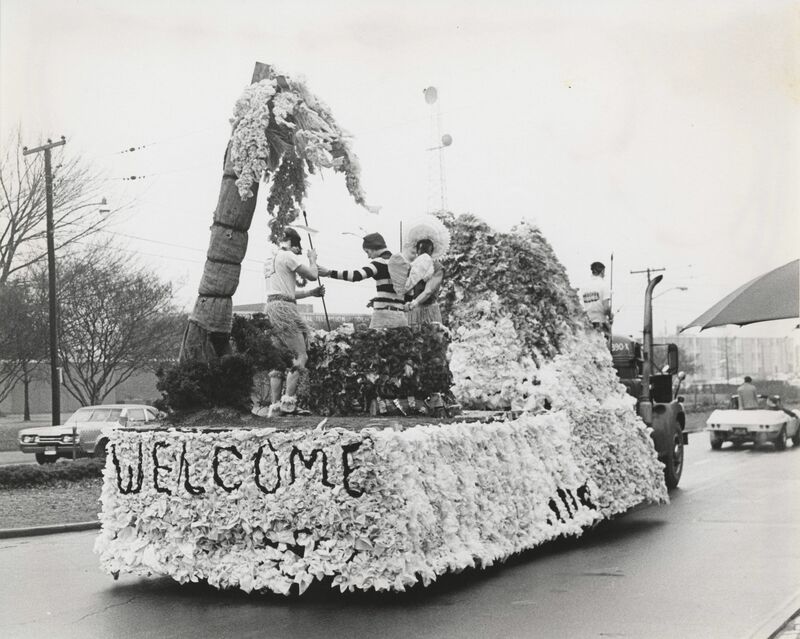 Originally taking place in the fall, Homecoming eventually moved to February in 1964 to align with the basketball season and the first Homecoming Parade was introduced in 1968. Due to changes in athletics and a lack of programming interest, the tradition was cancelled in 1991 but was revived by the Student Government Association (SGA) in 2000. Old Dominion University Photographic and Multimedia Collection, Special Collections and University Archives, Perry Library, Old Dominion University, Norfolk, Virginia, 23529. Mace & Crown, Old Dominion University, Norfolk, Va.
High Hat, Old Dominion University, Norfolk, Va. Alumni Association Records, Special Collections and University Archives, Perry Library, Old Dominion University, Norfolk, Virginia, 23529.